To prepare fans for what’s to come, Tyler, the Creator and A$AP Rocky joined forces in an equally silly and brilliant video for "Potato Salad." The short clip and freestyle verses they deliver are clearly an introduction to their upcoming collaborative project, WANG$AP. During the video, Tyler and A$AP are seen on the lawn in front of the Eiffel Tower in Paris, messing around and spitting bars to Monica's 2003 hit "Knock Knock." The song is notable for its production, stemming both from Missy Elliot and Kanye. Tyler even tweeted a few days prior to the "Potato Salad" release that he’d been trying to rap on this beat for ten years now. Understandably so, as the beat reminisces back to old school rap with a slow, steady rhythm and a major piano loop. Tyler, the Creator's verse remains true to himself as he spits a genius verse about his unique presence in the rap world. The most remarkable moment is the way he manipulates the concept of a video game controller in order to portray the ideas of shooting someone, calling out lames, and alluding to his money. At the same time, a Playstation controller appears on the screen, pulsing out the corresponding buttons he is rapping. The video even pauses like a YouTube video would, further punctuating the verse's strength. Tyler also randomly calls out Cole Sprouse, bringing about the humor aspect to "Potato Salad" and potentially pointing out his recently publicized sexuality. On the other hand, A$AP Rocky’s verse is much more aggressive, yet powerful, too. His most violent line, like Tyler’s, is perhaps his best. A$AP raps, "...got a bullet with your name on the barrel" as a bullet appears to rip through the screen. The visuals truly elevate the rhymes, making them more memorable. A$AP's rumination upon the rap game and its new players is also a very notable component of his verse. In it, A$AP calls out the new genre of mumble rapping in an impeccably articulate flow. 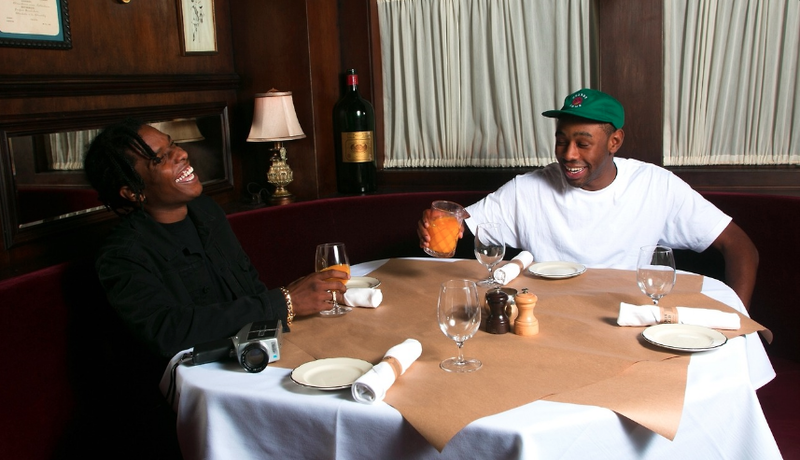 A$AP deviates from his usually calm and collected demeanor to joke around with Tyler in the video. At one point, he even reiterates a joke from 2010's The Hangover by holding out a purse and rapping: "this ain't a purse, it's a satchel." Playful jokes and impressive bars mixed with a visually pleasing video and even a camo appearance from Jaden Smith -- one thing's for sure, Tyler, the Creator and A$AP Rocky have definitely left fans wanting WANG$AP.